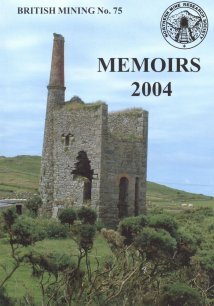 Wheal Hearle, St Just: History and Archaeology; Dabbling in Eskdale Iron Mining; The Meal Mill at Ballygrant; The Brades Coal and Steel Works, Oldbury, Staffordshire; Does Familiarity Breed Contempt? ? Age and Accident Frequency in Cornish Non-Ferrous Metal Mining, 1881-1901; Explosives in the Mines of the Alston Block during the 18th and 19th Centuries; The Inghams and the Thornhill Collieries Near Dewsbury; A Dispute Over Mining Royalties in the Bolton Area, 1836-1842.